Triple Crossing Brewing was a welcome addition to Richmond’s craft beer scene even before serving the public and Friday's grand opening has proven why it deserves to stay. Preferences of the four brews offered were unanimous. The Falcon Smash was the clear favorite, even for those who don’t consider themselves ‘hop heads’. Hopped, dry hopped, then dry hopped again, this IPA uses Falconer’s Flight and is a wonderful celebration of what an IPA should be. Don’t overlook the label and its reference to a certain punch with 8-bit text and shattered logo. The Element 79 golden ale was a close second and will likely be the biggest crowd pleaser. Don’t overlook the label with the electron shell around the symbol for gold, the periodic table’s 79th element. The Rye Pale Ale came in third with the rye enhancing the hop and malt without overpowering it with spice. At 6.0% ABV, the Single Hop Saison was very drinkable and refreshing in the heat although tasting ranged from too sour to a bit spicy. The brewery is situated on a side street downtown in a smartly-renovated old brick building that has been home to several local businesses. The interior mirrors the beer with a utilitarian sophistication mixing old basics with new finishes. Seating is available both inside and outside on the porch, making the brewery a great place to meet a few friends after work or host a larger party for a special occasion. Its proximity to many of Richmond's great restaurants offers plenty of local dining options to enjoy before or after a session. The event itself had three lines: a short one for purchasing tickets, a longer one used to redeem the tickets for beer, and a fluctuating line to the rest rooms. Although the crowd was large (it was nearly 6:30pm), the space never felt overwhelming and remained organized. The event offered a DJ, corn hole, and one food truck. Already offering a fifth brew, a sweet stout, and future beers such as their Liberty or Death Porter & Nectar and Knife DIPA, Triple Crossing should and will remain on everyone’s radar. For more information check out Triple Crossing Brewing's website or Facebook page. 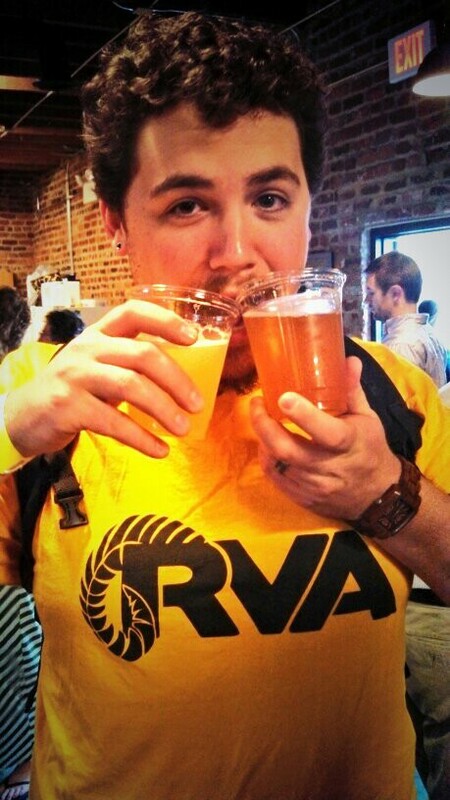 Photo: James enjoying a Saison and an Element 79 at the Grand Opening of Triple Crossing Brewery.